One of the major defects which pursues the study of history is the lack of a proper perspective. The subject is presented as a flow of dates, events and personalities of the past without any meaning or significance for the present or the future. No wonder most of the young and bright minds of our modern age find history not only dull and uninteresting but also irrelevant to the present or the future life. But when viewed in the right perspective as the story of the inner and outer evolution of human consciousness and life moving towards a glorious future perfection, history becomes one of the most enriching and illuminating field of education and knowledge. It can widen the horizons of the human mind, inspire hope and faith in human destiny and create a fertile soil for the flowering of the prophet and the visionary. This view of history is not altogether an unscientific proposition. Some of the best scientific minds of our modern age held a more or less similar view of terrestrial evolution. For example, eminent scientist Albert Szent-Gyorgyi who won Nobel Prize for isolating Vitamin C says, “My feeling is that living matter carries in itself a hitherto undefined principle, a tendency for perfecting itself. It may be that life owes its origin to this self-perfecting principle”. In this series we are presenting some perspectives on history, with an emphasis on the future, which can enrich the study of history and lead to a new way of looking at the past. So to look at the past with the eye of the future is perhaps the most creative approach to history or in other words history has to be integrated with futurology. In fact, the most important ‘use’ of history is its potential for giving a perspective into the future A comprehensive ‘feel’ or understanding of the manifest actualities of the past and present can give an insight into the unmanifest possibilities of the future. But the intuitions and speculations of the human mind can only be uncertain and tentative because human mind is not the power which decides the future destiny of humanity. The human mind, if it is intuitive, can at best, have only a glimpse of the future possibilities. But mind cannot have a clear and comprehensive vision of the future of humanity, emerging and future possibilities and the ultimate destiny of human evolution. To have such a total vision we have to rise beyond mind to the spiritual source of creation where the destiny of man and the world is determined by a transcendent and universal Power, Wisdom and Love. Here comes the importance of insights and perceptions of spiritual thinkers and seers like Sri Aurobindo, Telhard-de-Chardin and St. Augustine. They have perceived the deeper meaning of history with faculties greater than reason. Among these spiritual thinkers, Sri Aurobindo, had the most comprehensive vision of human and terrestrial evolution and its ultimate destiny. 4. The Mother, CWM, Vol.12, P.169. Thanks for your posting on the vacation industry. I would also like to add that if you are a senior thinking of traveling, its absolutely important to buy traveling insurance for retirees. When traveling, golden-agers are at biggest risk being in need of a health care emergency. Obtaining right insurance package in your age group can look after your health and provide you with peace of mind. 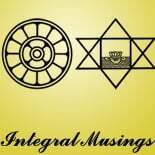 This entry was posted on June 15, 2016 by integralmusings in The Meaning of History.